Bienvenidos a la Hacienda de los Aroblitos!.......Enhance your visit by staying in a beautiful old world style Spanish hacienda for that true Southwest feeling. 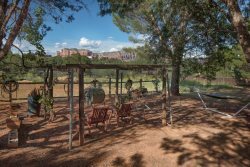 This 3,000 square foot hacienda sleeps up to 8 guests (2 bedrooms plus den with twin beds) and sits among the mesquite trees with a panoramic view of the Mingus Mountain range in the heart of the beautiful wine country near Sedona. When you and your guests aren’t out hiking the red rock of Sedona, shopping in Tlaquepaque, touring the Grand Canyon or visiting one of the local wineries, you can relax in the 6 person hot tub on the private back courtyard. The courtyard is the perfect setting to view the amazing pink swirled skies at sunset or the canopy of brilliant stars in the western sky at night. Keep your eye out for a shooting star! Perhaps you would like to grab your morning coffee and take a peaceful stroll along the walking path through the mesquite grove or gather around the outdoor fireplace and plan out your days adventures. The chef in you will love preparing a meal in the spacious kitchen equipped with stainless steel appliances, solid wood cabinetry, and granite counter tops. The reverse osmosis water filter not only supplies a tap on the sink but also the ice maker and water dispenser in the refrigerator for a refreshing glass of ice water. Turn on the kiva fireplace and curl up on the king size bed and watch a little tv before bedtime. Soak in a warm bubble bath in the large master bathtub or shower off in the separate walk in shower. There is a private courtyard off the master bedroom. Your guests can sleep peacefully in the queen size pillow top bed in the second bedroom that connects to a screened in covered alcove with patio seating. The alcove also connects to a cozy den which contains two twin beds. There is also a queen size leather sleeper sofa in the living room. So, if you are looking for a luxurious, peaceful vacation rental close to the local tourist destinations but still offers a quiet and calming sanctuary then you will enjoy your stay in this Southwestern retreat. Located in the heart of wine country you are only a 15 minute drive from wineries in Cottonwood and Cornville. The historic mining town of Jerome is only a 30 minute drive and provides some breathtaking mountain side views of the valley. A 30 minute cruise down 89A will take you through the gorgeous red rocks and into Sedona. The Foothills team was excellent. We were in town and had a chance to look at several homes before booking our choice. A friendly agent took us around to look through the homes we were interested in, explained the area, and the pros and cons of staying in various locations. Very helpful and friendly. The Spanish hacienda we stayed in was wonderful. A beautifully built, beautifully decorated, nicely furnished and very well equipped (pots, linens, towels, etc) place to stay. Everything in the home was high quality and in perfect condition. We stayed for a month, and the house was just a joy to live in. Also, very private on a large, nicely landscaped yard with a Spanish style wall, courtyards, and a wonderful grove of mesquite trees in the back.